These grey monthly disposable contact lenses are suitable for dark and light eyes. They provide you with a very natural eye color change into lovely grey and great comfort of use thanks to modern and advanced manufacturing technology incorporated by Alcon. Freshlook ColorBlends Sterling Gray contact lenses are among the most popular colors chosen by women as well as men all around the world. 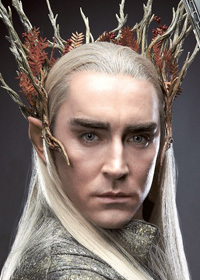 They can become particularly useful if you're planning to dress up as Thranduil from The Hobbit movie - his eyes are beautifully grey.